TEM images of LAS-2 (a), LASGC-2 (b), LASGC-3 (c) and LASGC-4 (d) samples. Examples of nano-sized ZrTiO4 particles of different shapes are shown in (b). Glass–ceramics formed by controlled crystallization of Li2O–Al2O3–SiO2 (LAS) parent glasses are well-known for their low thermal expansion and transparency. In order to promote bulk crystallization, it is necessary to add nucleating agents like TiO2 and ZrO2 to the glass composition leading to ZrTiO4 nuclei during heating, followed by the crystallization of a β-quartz phase that transforms into β-spodumene at higher temperature. Generally, these glass–ceramics present a yellowish-brown coloration whose intensity increases with the crystallization rate and that is partly due to coloring elements like titanium. In this study, we investigated the origin of the evolution of the color of LAS glasses and glass–ceramics by varying the TiO2 concentration. To do this, several TiO2-bearing LAS glasses (with TiO2 ranging from 0 to 4 mol% and 1 mol% ZrO2) were prepared and heat treated at a given temperature (925 °C) to study the impact of the TiO2 concentration on their crystallization behavior and their color. 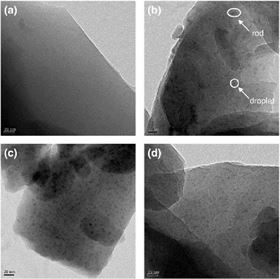 The crystallization and microstructure of LAS glasses and glass–ceramics were studied by DTA, XRD and TEM whereas their structure was investigated by EPR, optical and X-ray absorption spectroscopies. From all the results obtained, the evolution of the optical absorption and coloration of LAS glasses and glass–ceramics was mainly explained by Ti4 +–O2 − charge transfer (glasses) and by gap absorption and Rayleigh scattering of nanocrystals (glass–ceramics). This paper was originally published in Journal of Non-Crystalline Solids, 384 (2014), Pages 15-24. Researchers have used the shape of cicada wings as a template to create antireflective structures made from titanium dioxide.